October 5, 2011 - ITT has launched a Web-based data visualization application that enhances the safety and operational efficiency of Alaskan airspace by providing unprecedented fleet awareness. ITT’s AlaskaVue provides a cost-effective solution for understanding in real time where flight assets are located. This capability is particularly significant for Alaska, where weather, terrain and gaps in radar coverage can affect situational awareness and contribute to accident rates that are much higher than in the continental United States. 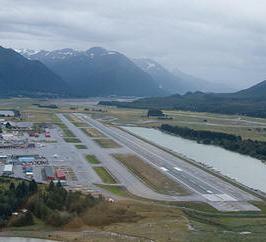 “Alaskan airspace has undergone a dramatic transformation in recent years. It began with the success of the Alaska Capstone Project, which laid the groundwork for implementing the Federal Aviation Administration’s (FAA) Next Generation Air Transportation System (NextGen) initiative,” said John Kefaliotis, ITT’s vice president of next generation transportation systems. The Capstone Program is an FAA funded safety program located in Alaska, primarily focusing on rural areas of the state. The program concentrates on increasing safety in aviation through technology and making the process of integrating that technology more efficient. Some of the systems currently being developed in Capstone includes GPS Receivers, Data Link Transceivers, ADS-B, Multi-Function Displays, Flight Information Services, Moving Maps, and Terrain Databases. The AlaskaVue application service has pan and zoom capabilities; multiple views, such as satellite, maps, charts and elevation; multiple overlays, such as significant boundaries, runways, air routes and navigation aids; flexible display options; and color coding of flight objects. AlaskaVue includes saved views and historical playback. Subscribers to AlaskaVue will access the data visualization application and the comprehensive surveillance data via the Internet. AlaskaVue is based on a synthesis of multiple FAA system-derived aircraft surveillance data available in the U.S. National Airspace System. AlaskaVue data sources include data derived from the U.S. Automatic Dependent Surveillance-Broadcast (ADS-B) network being deployed by ITT, along with Wide Area Multilateration (WAM) data from FAA-deployed WAM systems. ITT Information Systems provides networked decision-support solutions to government and commercial customers through sophisticated information integration and protection, such as next-generation air traffic management and information and cyber solutions. ITT is currently under contract with the FAA to deploy, operate and maintain the ADS-B system, the cornerstone technology of NextGen that will transform the ground-based air traffic control system of today to a more efficient, satellite-based system. ITT’s ADS-B contract performance is meeting all contract milestones in accordance with an aggressive schedule set by the FAA in 2007.